Tue, Oct 23, 2018, 08:48 pm SL Time, ColomboPage News Desk, Sri Lanka. Oct 23, Colombo: The All Ceylon Makkal Congress (ACMC) has lodged a complaint with Colombo Police HQ on the alleged plot against its leader, Minister of Industry and Commerce Rishad Bathiudeen. ACMC Parliamentarian, Deputy Minister Ameer Ali and Party Secretary S Subairdeen lodged the complaint on Tuesday, October 23 on recent revelations about the alleged assassination plot on their leader. Speaking to the press after their visit to Police HQ, MP Ameer Ali said that official action should be taken on alleged plot, which is reported in the media. According to the ACMC, the alleged plot to assassinate Leader of ACMC Rishad Bathiudeen by a Director of 'Dushana Virodhi Balakaya' Namal Kumara, former TID DIG Nalaka Silva, and a resident in France Thushara Peiris has been revealed in the media. 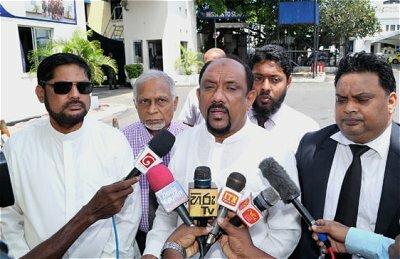 "Reports on an alleged plot to assassinate Leader of ACMC Rishad Bathiudeen by a Director of 'Dushana Virodhi Balakaya' Namal Kumara, former TID DIG Nalaka Silva, and a resident in France Thushara Peiris, have been aired in the recent weeks by local TV channels, news media and web media. A taped conversation between Director of 'Dushana Virodhi Balakaya' Namal Kumara, and the resident in France Thushara Peiris, that was aired many times by the Channels mentions about assassination of Minister Rishad Bathiudeen during a ceremony in Batticaloa. Also accusations have been made saying that the French resident Thushara Peiris has provided funding/financing to Director of 'Dushana Virodhi Balakaya' Namal Kumara to assassinate Minister Rishad Bathiudeen and place the blame on it on the Tamil Community. (Hon) Minister of Law and Order Mr Ranjith Madduma Bandara, at a recent Press Conference, has also stated that a wide-ranging investigation will be carried out in this regard. Herewith we also submit some recorded news clips from various media channels on this issue. Since there is a possibility of a dangerous situation brewing in the country as a result of this alleged assassination plot, we call your full attention on it and request to take legal steps after a thorough investigation. We also wish to draw your attention to the security needs of Hon Minister." Yours Sincerely -S Subairdeen (ACMC General Secretary) and MSS Ameer Ali (ACMC Chairman, and Deputy Minister of Fishery, Aquatic Resources).